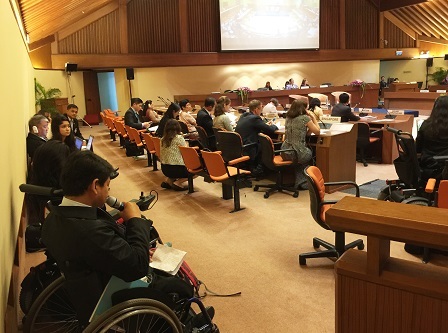 As one of the Working Group members, the Asia-Pacific Development Center on Disability (APCD) attended the Third Session of the Working Group on the Asian and Pacific Decade of Persons with Disabilities, 2013-2022 in Bangkok, Thailand from 2 to 4 March 2016. 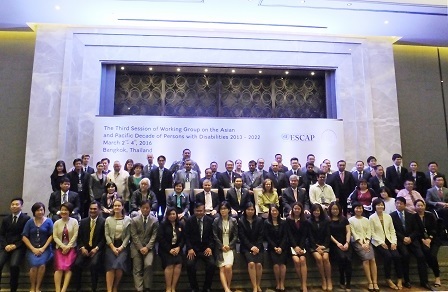 The event was organized by the United Nations Economic and Social Commission for Asia and the Pacific (ESCAP) in cooperation with the Government of Thailand through the Ministry of Social Development and Human Security (MSDHS). With around 100 participants, the Session highlights included a review of the implementation of the Incheon Strategy to "Make the Right Real" for Persons with Disabilities in Asia and the Pacific based on its 10 Goals. Future recommendations were made as a result of the Meeting. The World Network of Users and Survivors of Psychiatry (WNUSP) and APCD conducted a side event to the Incheon Strategy Working Group Session on "Transforming Communities for Inclusion of Persons with Psychosocial Disabilities" on 3 March 2016, in Bangkok, Thailand. 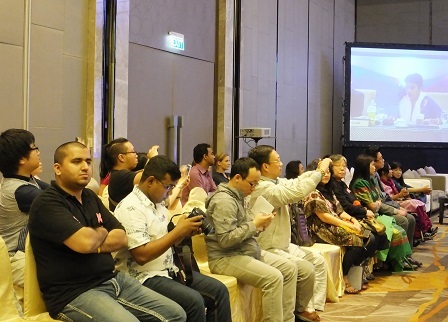 The event was held with support from ESCAP, the MSDHS, Transforming Communities for Inclusion (TCI) Asia, International Disability Alliance (IDA) and Open Society Foundation (OSF). The aim of the event was to bring attention to the rights of persons with psychosocial disabilities, as stated in Article 19 of the United Nations Convention on the Rights of Persons with Disabilities in terms of living independently and being included in the community. 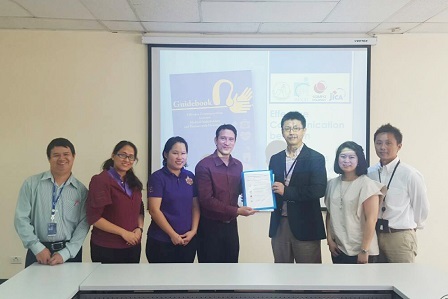 In collaboration with the APCD and the Japan International Cooperation Agency (JICA), a project on effective communication between medical personnel and persons with hearing disabilities was implemented by the Deaf Association of Bangkok (DA.BKK) with support from the Sompo Japan Nipponkoa Welfare Foundation. A presentation of the final activity report for this project was held by DA.BKK to Sompo Japan Nipponkoa Welfare Foundation on 15 March 2016 in Bangkok, Thailand. The president of DA.BKK expressed his appreciation to the Sompo Japan Nipponkoa Welfare Foundation through its vice president, the APCD and JICA for their support. In 2015, a seminar on 'Effective Communication Between Medical Stakeholders and Persons with Hearing Loss' was organized by DA.BKK and APCD in Bangkok. A guidebook meant to improve communication between the two groups was also launched at the seminar. 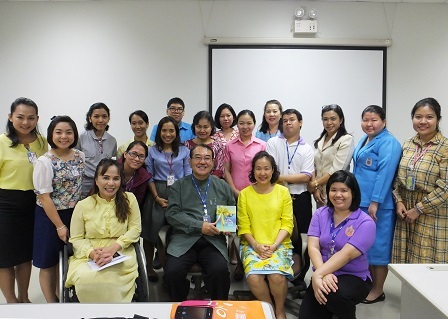 The APCD welcomed teachers from Chitralada School on 21 March 2016 for a study visit of the 60 Plus+ Bakery and Cafe, a human resource development branch that promotes the disability-inclusive business concept for Thai persons with disabilities, and to know more about APCD's roles, projects and activities on disability in the Asia-Pacific region. They also interacted with the participants of the ongoing Skills Development Training for the Empowerment of Thai Persons with Disabilities 2016. The visitors aims to effectively apply what they have learned from the visit to occupational classes for special needs education students. The APCD was among those who participated in the Fourth Session of the United Nations Economic and Social Commission for Asia and the Pacific (UNESCAP) Committee on Social Development from 28 to 30 March 2016. The APCD, in cooperation with the South Asian Disability Forum (SADF), shared interventions on the need to develop good quality mid-term report in 2017 about the effective implementation of the Incheon Strategy. It also stressed the importance of promoting disability-inclusive development to ensure the inclusion of the disability agenda in all development issues.